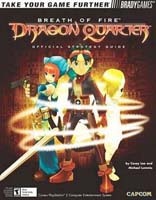 BradyGames' Breath of Fire: Dragon Quarter Official Strategy Guide features an all-inclusive walkthrough to guide players through the enitre game and area maps that pinpoint all key items. Complete bestiary to help players defeat every enemy. Top-notch boss tactics to ensure victory in each battle. Magic spells, game secrets, and bonuses revealed!